This October my work will be included in a group exhibition titled Spectrum of ROY: Scott Goss, Nate Ricciuto, Liz Roberts, and Mark Reamy ROY G BIV Gallery in Columbus. 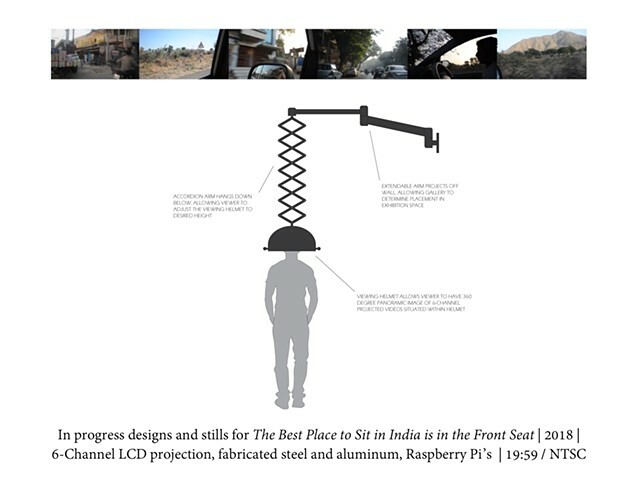 Here I will debut a new piece I've been working on the last year called The Best Place to Sit in India is in the Front Seat. This will be an interactive installation where the viewer can enter my memories of a 2012 family vacation to India. The show runs February 3-24, with an opening reception on Saturday February 3 from 7-10PM. I look forward to seeing you there! With great pride I announce that I have officially been awarded a FY2015 Individual Excellence Award from the Ohio Arts Council. This award is given to an Ohio artist to allow them both time and money to produce their work. It is judged solely on evidence and merit of past artistic work and an open panel review conducted by nationally recognized professionals. I am very excited to have received this award and to have joined the ranks of the many distinguished Ohio artists who have previously received it. It is with great pride and excitement that I announce that this past fall I was awarded a 2014 Harpo Foundation Grant. The Harpo Foundation is a national funding organization that supports the work of under recognized artists in their respective fields. The foundation seeks to stimulate creative inquiry to encourage new modes of thinking about art. Click Here to see the full list of 2014 grant recipients.